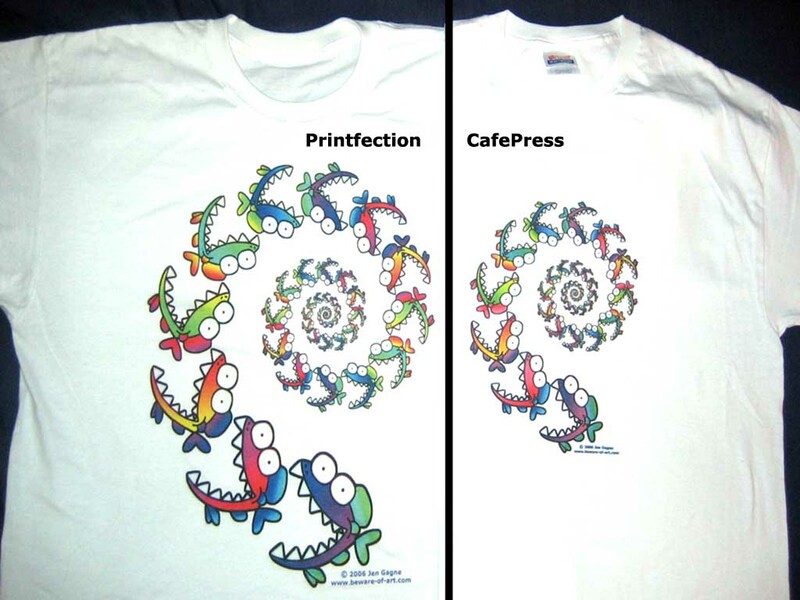 Comparison tests for Printfection and CafePress t-shirts. 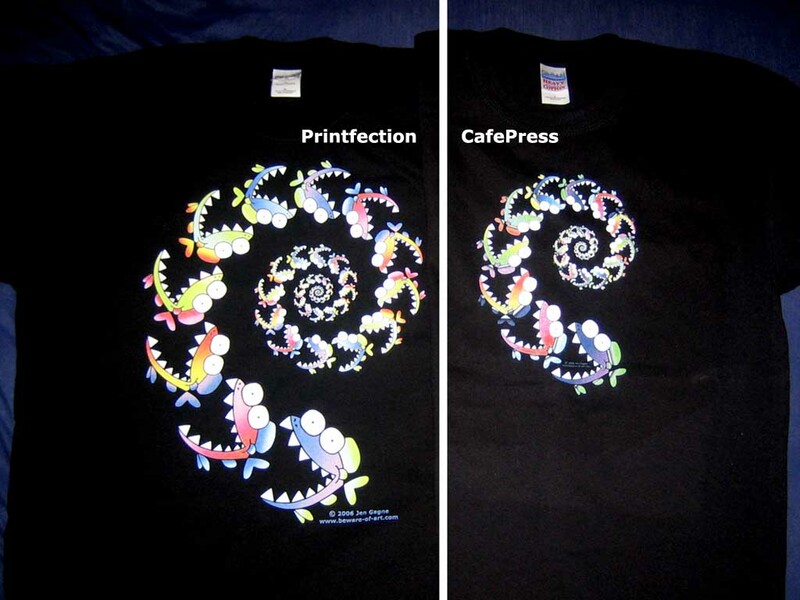 Here's a comparison of the t-shirt print tests from Printfection (left) and CafePress (right). I'm happier with Printfection's overall print quality... the black lines on the CafePress white shirt are either doubled or blurry. The black CafePress one has weird semi-transparency in the fins which wasn't there in the original image (?) and the color fields seem less smooth. Still, I could make do with the CafePress shirts. Those differences don't really show in these comparison shots, not at this resolution -- no, what I'm trying to show here is the major difference in impact the image _size_ makes. I'm just plain happier with the larger images Printfection can print. This leaves me with something of a dilemma, as CafePress offers all the OTHER items I'd like to sell (magnets, cups, etc.) I guess I could set up a separate store on each site, and also use them to drop ship items I sell through eBay, or... something. Hrm. I think I'll stop by the Printfection forums for advice on how to have my cake and eat it too. I LOVE THE BIG ONE! I dunno about Zazzle (yet) but Printfection goes up to 5x I think. They also scale the design up so it's still proportional to the shirt even at larger sizes... so, you don't get the postage stamp effect!